Probably the most fruitful part of the year was the addition and collaboration with Ashley. With a background in fashion design and creative direction, Ashley’s International career led her to work with Ralph Lauren to Calvin Klein and Nautica. Her attention to detail and pure understanding of luxury brands and fabrics makes her a true asset. Admittedly it’s been a while since I posted. I guess that’s because we have been busy! Reflecting on the year, and setting sights and goals for 2019, it fills me with great gratitude to look back on the people and projects that we have collaborated with. Here are just a few highlights. This has been an exciting and inspiring relationship. With three trips to the overseas factory in one year, I’ve really gotten to know the ins and outs of this amazing company. I’ve helped with in-house material schemes and have had the pleasure of working with their amazing clients on helping their dreamboats come to fruition. The GT 50 that launched in Newport was a great opportunity to flow. Helping to develop the sportscar of the line was right in my wheelhouse. It was a real pleasure to work with the clients of this M42. We refreshed the boat to reflect the true personality and style of her new owners. From boutique Ralph Lauren fabrics, to vintage brass flatware, this boat is a true gem on the water. We welcomed the opportunity to get to know Dodson’s Boatyard in Stonington, CT a bit better through the process. This was another great project, and again, great fun to transform the interior to suite the style of her new owners. 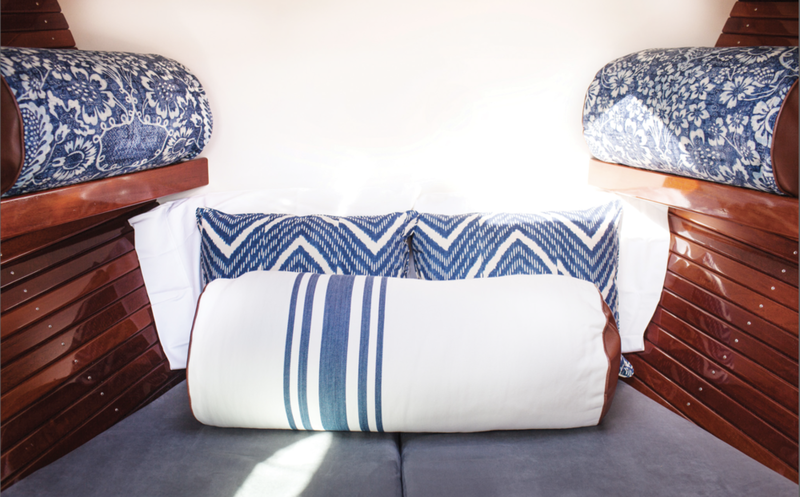 Updated white countertops, fabrics, bedding and upholstery really elevated this sailboat. We also worked with the Chef and owner to outfit the galley and heads with all the essentials for charter and private use. There's something about an end-of-season snow storm that inspires me. We stay indoors, we look around, cozy up and find some inspiration. Joe and I bought this 1813 farmhouse a little over a year ago...the projects never end...and you know what? I don't want them to. Just like the Morris, our house is just another canvas. When we let it flow, it's amazing what bubbles to the surface. I've been working with Morris Yachts for a few years now...but I was excited when I got the call to collaborate with Sunbrella Fabrics, North Sails, Raymarine and Awlgrip on the 10th anniversary of the Morris Yachts M-Series 36' sailboat. This is a beautiful, classic daysailer. Driving up to Mount Desert Island, Maine I was thinking about how I've used Sunbrella for years...but never for the ENTIRE design of a boat. But, as you know, I am always up for a challenge. I met with the creative director of Sunbrella, Gina Wicker and her team. Turns out, I was not just outfitting the boat, but participating in a project called "Perspective New England" where a yacht, an airstream and a beach house would all be outfitted with Sunbrella Fabric. Gina showed me so many products that surprised me. We all know that Sunbrella is great for outdoor furniture, awnings and dodgers...but I was pleased to see that there were some lush, linen like fabrics that I am happy to employ down below...She also revealed to me that there is a new embroidery thread coming out that has the same properties as Sunbrella in that it won't fade or mildew and is totally cleanable. The interior of the M36 is a total clean slate...The wheels are turning like mad. Here we go!